SRP Series 240V Pre-Assembled Self-Regulating Pipe, Roof and Gutter De-Icing Heating Cable is designed for a variety of pipe, roof and gutter de-icing applications. The cable is constructed so that it will not burn out or overheat when overlapped, and can be used on shingled or metal roofs as well as metal or plastic pipes. 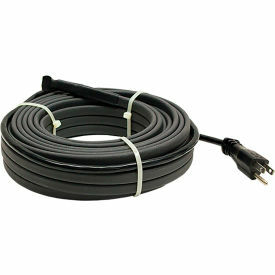 The cable ins pre-terminated with a 30 inch cold lead, 240V and end-splice. Works down to -40°F. Cable will not burn out overheat when overlapped.